This adorable cake kept me in giggles. Every time I'd look at it, and at it's counterparts, the ladybug cupcakes, I couldn't help but to smile. One of my nieces got this cake for her 3rd birthday. It was very easy to decorate and it didn't take much more than a box of cake mix, some colored icing and a marshmallow. As you can see, I didn't use red icing. The darker red the icing got, the more bitter the taste became. So I stopped at a more "deep pink" color. I also used chocolate icing instead of black. It seemed to go well with the pink color anyway. 1 standard box of cake mix (whatever flavor you prefer), baked and cooled. You will only need one round layer for this cake so I usually make 12 cupcakes with the extra cake mix. 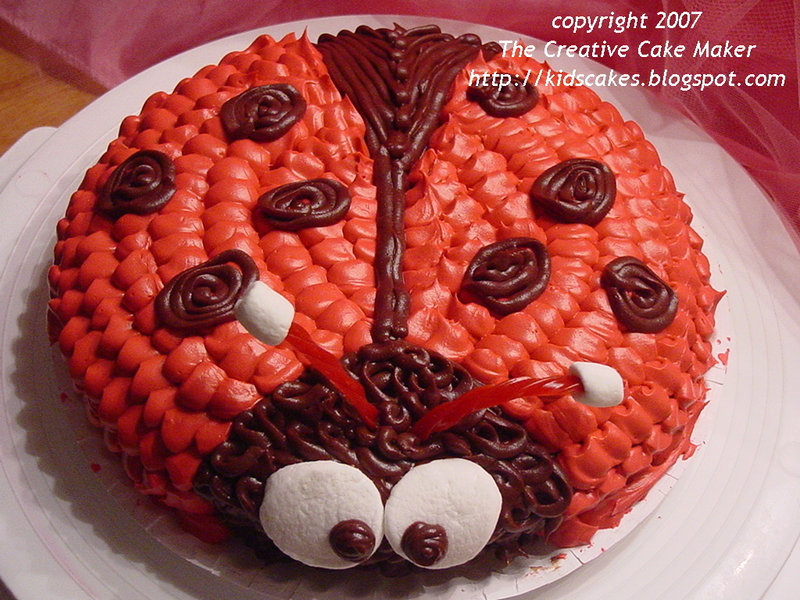 Red gel coloring or food coloring - I recommend using Wilton no-taste red icing gel coloring. The gel coloring is more concentrated so you get a deeper hue without using all your coloring. The red color also tends to be bitter so the no-taste red helps to combat that. If you have not already done so, bake your round layer cake according to package directions and cool it completely. If it is not cooled, your icing will start to melt and slide off the cake. Place your cake right side up on the plate you will display it on. If you prefer, you can place your cake on a cake board and move it to it’s permanent home once it is completed. However, most of us don’t have cake boards handy. The cake pictured here is resting on a paper plate. First, fill one Ziploc sandwich bag (or similar brand) 1/3 full with some chocolate icing. Push the icing toward one of the bottom corners of the bag. Snip a small hole in the corner of the bag with your scissors. Twist the excess bag to create a decorating “piping bag”. Place the “twist” in the joint between your thumb and the rest of your hand. Close your hand over the rest of the bag. To decorate your cake, you will squeeze the bag. Try it a little on some wax paper to get used to it. Now, “pipe” an outline for the head and under-body parts of the ladybug. These are the areas you would normally color black on a ladybug. Next, fill in the areas. I filled in the head area with swirls and the back area with lines. Then, Fill a Ziploc bag 1/3 full with red icing. Just as you did with the chocolate icing, push the icing toward one corner and cut a hole in the corner. This time, cut a larger hole. Make little “blobs” of red icing – about dime sized – all over the remainder of the cake. You could simply smooth on the red with a spatula, but I feel it is easier and less messy for me to pipe it onto the cake. 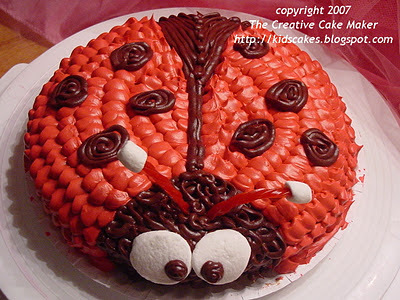 Once the red area is done, pick up your chocolate icing bag again and pipe spiraled circles onto the back of the ladybug. They don't have to be symmetrical and there doesn’t need to be a lot. Six 1-inch circles should be plenty. For the eyes, cut the ends off a large marshmallow and press them close together at the front of the cake on the chocolate “head”. Then, pipe chocolate "eyes" onto the marshmallows. Suddenly, with the eyes done, the cake becomes a giggle grabber. For the antennae (optional), cut strips out of a length of a red Twizzler and push one end of each down into the cake just above the eyes. I cut a 3 or 4 inch length off and cut it into 4 strips, using only 2 for the cake. On the exposed end of each, I attach a miniature marshmallow. It's easier if you make a hole in the miniature marshmallow first with a knife, then push it onto the Twizzler piece. 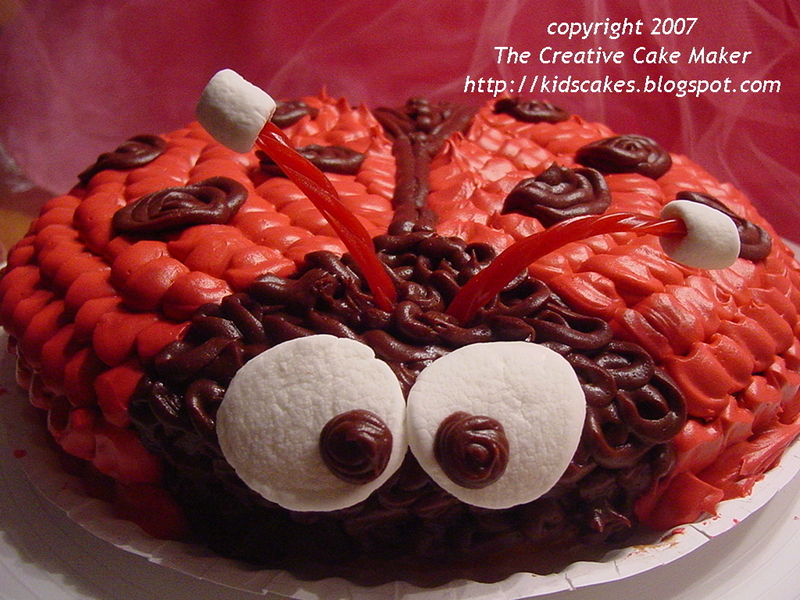 With the antennae done, your cake is finished! You can put candles in the cake and enjoy! I just made this cake for my daughter's 1st birthday which had a ladybug theme. It was a huge hit! I also made the matching cupcakes for the kids and they were really cute!